The crunchy texture and sweet taste of bean sprouts add a flavor to many Chinese dishes. It’s this combination of taste and texture that has made bean sprouts a very popular vegetable in both the East and West. First, a bit of clarification, by bean sprouts, we are referring to mung bean sprouts, the distinctive plump silver sprouts with two yellowish “horns” at one end and a scraggly tail that comes from the sprouted seed of the mung bean plant. Chinese people have been growing mung bean sprouts for approximately 3,000 years however the popularity of bean sprouts in the West is a more recent phenomenon due to bean sprout’s health benefits and low calories. Low calories, mung bean sprouts contain almost no fat or calories. They are a dieter’s dream! A great way to consume vitamins C.
Bean sprouts are a brilliant source of folic acid, which can help you to prevent anemia and birth defects. According to the U.S. Department of Agriculture, one cup of bean sprouts contains a mere twenty-six calories. They are low in salicylate, a naturally occurring chemical in plants that some individuals have difficulty tolerating. (Aspirin is acetyl salicylic acid). In Chinese medicine bean sprouts are considered to be a yin or cooling food. Both the texture and taste of mung bean sprouts—crunchy with a delicate hint of sweetness—enhances many popular Chinese dishes, from egg rolls to stir-fries and salads. When you shop for mung bean sprouts, make sure you look for the plumper ones that are not stringy or discoloured. If they are correct, place in a plastic bag with a few drops of water, seal and keep in a refrigerator. If stored in this manner, they will last for one or two days. If you need to keep them longer, you can try covering them with cold water and storing in a sealed jar in a refrigerator. If the water is changed every two days, they should last for up to a week. However, since they are so easy to find and generally really cheap, we prefer to wait and purchase them just before using. Also, mung bean sprouts can be frozen for usage at a later date. Another option is to grown your own and this requires a quite simple procedure; begin by washing 1/2 cup of mung beans and draining, then soaking overnight in water. Drain the soaked beans and place them in a large glass jar (one that holds 4 cups or 32 ounces) and cover with water. Place a piece of cheese cloth or similar material over the jar, using a rubber band to hold it in place. Change the water once a day. After several days the sprouts will plump and long. Rinse them, drain and refrigerate. You will sometimes find recipes calling for silver sprouts (銀芽); these are bean sprouts that have had their ends removed. Trimming the sprouts is time consuming, but it’s done for aesthetic purposes only. We often skip this step. If you have been working all day, are tired and just want to cook a no hassle dinner, don’t trim the mung bean sprouts. They taste just as good trimmed and untrimmed. On a health-related note, mung bean sprouts have been linked to incidences of food borne illnesses such as salmonella. Government officials in both Canada and the United States are working with growers to implement safer growing methods. In the meantime, you can reduce the risk significantly by cooking the sprouts in soups or stir-fries. Below are some delicious recipes that use mung beans sprouts, we hope you will like them. Delicious Zhajiangmian Chinese Noodle Recipe: Zhajiangmian is one of my favourite Chinese noodle dish. 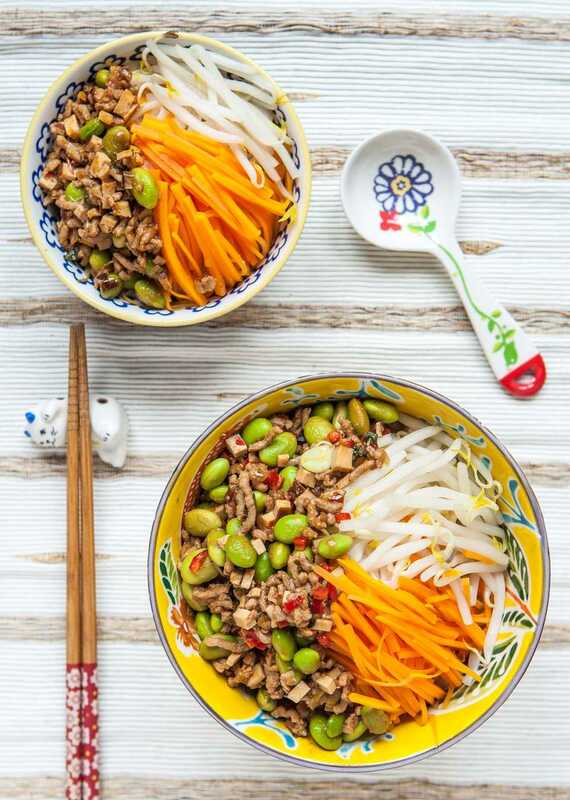 The noodle sauce contains edamame beans, pork mince (you can also use beef mince instead), chilli bean sauce and garnish with blanched julienned carrot and mung beans sprouts. Honey Beef with Toasted Sesame Seeds: Beef with sesame seeds—Stir-fried beef coated in a honey sauce and topped with toasted white sesame seeds. Buddha’s Delight: A delicious vegetarian stir-fry recipe: This vegetarian dish is very popular in Chinese cuisine. Home Made Chinese Egg Rolls with Pork or BBQ pork: Chinese Egg Roll Recipes—An easy to make recipe for this perennial party favourite. Includes tips on cooking and freezing egg rolls. Honey Beef Stir-fry: Honey beef stir-fry—Sweet honey and tart black rice vinegar make an intriguing combination in this stir-fry recipe. Singapore Noodle with Rice Vermicelli Recipe: Singapore Noodles is a popular Asian dish made with thin, curried rice noodles and vegetables, with shrimp or meat as an optional add-in. Scrumptious Spring Rolls with Barbecued Pork: Juicy Chinese barbecued pork is paired with crispy vegetables in an oyster-flavored sauce in this Chinese spring roll recipe. Stir-fried Egg Foo Yung: Egg Foo Yung-Whether you spell it egg foo yung or egg fu yung, the Chinese-American version of an omelet tastes delicious. Includes a sauce recipe. Stir-fried Fish Fillets with Ginger: Try this Seafood Recipe for Stir-fry Fish Fillets, a Chinese recipe made with ginger, sesame oil, and oyster sauce. Turkey Chow Mein: Chow mein is a great way to serve leftover turkey from Thanks giving or Christmas dinner. Chinese stir-fry Mung Bean Sprouts Recipes: Mung Bean Sprouts are a really popular vegetable in Chinese cuisine, and this article teaches you how to cook with them.